Someone once told Christopher J. Driver that he had "gentle eyes." Chris loves sci-fi movies, wrote his master's thesis on Blade Runner and finds Soderbergh's version of Solaris underrated. The Star Wars prequels are dead to him, but he really liked THX-1138. Chris loves the work of Terry Gilliam, thinks Michael Keaton was the best Batman and that Grosse Pointe Blank and Planes, Trains and Automobiles are masterpieces. Today, Chris writes a variety of creative content for a digital advertising agency. Prior to that, he wrote for the marketing department of a software developer, after spending five years as a technical writer at a healthcare nonprofit. He has published freelance, academic and popular culture essays and enjoys blogging about movies, music, TV, books, video games, comics, cooking, camping and travel, at hardbarned.com. Above all, Chris considers his writing skills versatile. HARDBARNED! is his first book. HARDBARNED! One Man's Quest for Meaningful Work in the American South by Christopher J. Driver is a memoir that reads like nothing I have read in a long while; brutally honest, an unadulterated X-ray of the crude realities that confront contemporary American workers. The author has earned two undergraduate degrees and thought he was well-equipped to land a writing job, but instead he found himself doing jobs that did not align with his educational background and skill set — construction, retail, warehouses, hotels, etc. But would returning to school to earn a Master’s Degree in English help him land the dream job? Here is his answer: “Let’s get that straight from the beginning. I made a living as a barn-hauler because I needed to pay off my student loans and earn a living.” And isn’t this the reality for many underemployed or unemployed Americans? 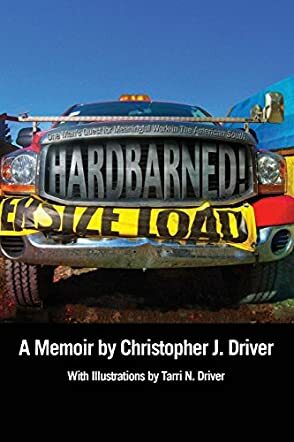 Christopher J. Driver’s memoir is as entertaining as it is critical of the social realities of his time, a book that brilliantly captures the pain and the frustrations of a wide section of America’s working class. In this memoir, the reader follows the journey of a man who will do anything to earn a living while searching for what could satisfy his deepest yearnings. Is it possible to do the work we were meant to do? This is a difficult question to answer, but this book is a huge testament to the author’s creative spirit, his endurance, and the vision that kept him going even when the odds were stacked against him. HARDBARNED! One Man's Quest for Meaningful Work in the American South is the work of a master, deft and balanced, infused with a rare sense of humor and satire. I enjoyed the crisp prose and the excellent descriptions, but it was the author’s unique and compelling narrative voice that kept me turning from one fascinating page to the next.